Hi friends! 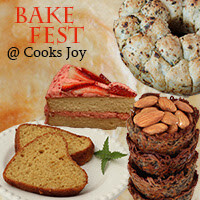 I am so happy to share this news that this month am hosting one of Blogosphere's most cherished event, bake fest. All thanks to Vardhini of Cook's joy to think of such a beautiful event and letting few of us host it. 4. Linking back to my announcement page and to Vardhini's Bake Festhttp://cooksjoy.com/blog/bake-fest-hosting-schedule announcement is mandatory. If sending an old entry, it needs to be re-published with both links. Will post the round up in the first week of April. Have fun friends and send us loads of love with your unique baked goodies. Lovely blog! I have sent you 2 of my entries for your event. Feel free to contact me if you need any further info. Happy hosting!